Reach Description: Reach 1 is the area along Constitution Boulevard (2700 South) from West Valley City Hall at 3600 South extending north to 3100 South. This area includes both large and small businesses, as well as many residents. Access to all business and residences will be maintained throughout construction. Current Construction: TRAX construction is taking place in conjunction with UTA’s bus rapid transit project on Market Street. Crews are currently working on the station platform in between West Valley City Hall and the Public Safety Building. Watch for project signs in the work areas that display West Valley TRAX Line fact sheets for more information. Traffic Impacts: Market Street is closed for North/South traffic between 3650 South and Lehmann Avenue. Current Construction: Construction has begun on the TRAX bridge over I-215 on the south side of 3100 South. The foundation work for this structure includes driving steel pile into the ground using a machine that may generate significant noise and vibration for local residents. To help alleviate impacts, pile driving activities will be limited to the hours of 7:00 a.m. to 5:00 p.m. Monday through Friday. Construction on this bridge will also include minor lane restrictions periodically on I-215 throughout the next couple of months. Upcoming Construction: The intersection at Mapleway and 3100 South will close to traffic within the next two to three weeks for about one month. Pedestrian access will be maintained at this closure. We will make personal contact with residents prior to the closure to address any concerns. Traffic Impacts: There will be some lane restrictions on I-215 as crews progress with bridge construction. A closure at Mapleway and 3100 South will take place in about two to three weeks. Current Construction: Crews are currently working on a storm drain on the east side of Decker Lake Drive. Access is being maintained and we thank the businesses and motorists for their support during construction. Traffic Impacts: Access to businesses is being maintained. Please be mindful of workers and obey posted speed limits. Current Construction: The majority of construction on the West Valley Line has taken place in this reach on the east side of Redwood Road. Crews are now installing a permanent wall along both sides of the Crosstowne Trail. Significant drainage and irrigation work has been accomplished as well as foundation work for TRAX’s overhead wiring system. A permanent fence has been installed just east of the Brighton Canal to the Khadeeja Islamic Center on Parkway Avenue. Upcoming Construction: Sound wall installation in the Chesterfield neighborhood is anticipated to take place over the next couple of months. · The Crosstowne Trail along 2770 South just east of Redwood Road to the Brighton Canal is currently closed. Once TRAX construction is completed, the trail will once again be operational. Current Construction: The majority of construction is taking place on 1070 West just north of Parkway Avenue. Third party utility work is currently taking place and there will be some lane restrictions implemented at this time. Work on a joint trench for utilities and sewer line work is also taking place along 1070 West, as well as pile driving for a retaining wall. Traffic Impacts: As construction proceeds, there will be some lane restrictions. However, we will maintain access at all times. Reach Description: Reach 6 runs through the Union Pacific Railroad’s Roper Yard area. Although there are no businesses and residents, extensive coordination will take place with the Union Pacific Railroad to ensure that freight deliveries and other train travel will be maintained. Reach 6 will include an extensive bridging system that will enable TRAX to operate above ground, over other train traffic. Current Construction: Crews have installed steel piles 120’ into the ground to form the main foundations for the aerial bridge that will carry TRAX over the Union Pacific Railroad tracks. Crews are currently pouring concrete to form the columns for the bridge. Utility work is also taking place. Reach Description: Reach 7 is the area where the West Valley Line will connect with the current North/South TRAX Line. Construction will take place along Andy Avenue in South Salt Lake. Crews will closely coordinate activities with businesses to ensure access is maintained. A construction survey has been conducted with the businesses along 400 West between Andy Avenue and 2100 South to determine the best time to construct in the Andy Avenue/600 West intersection. Current Construction: Storm drain installation along Andy Avenue has been completed. We thank the businesses in this area for their support during construction. Upcoming Construction: The next phase of construction will begin near Andy Avenue next spring. We will continue to work with businesses to maintain access and mitigate any issues that may arise. UTA is committed to maintaining 24-hour access to all businesses and residences along the construction corridor. We will coordinate with the public in cases where temporary access might be required. If you have further questions not answered by this report or any comments regarding the project, please contact toll-free 24-hour hotline at (888) 800-8854 or e-mail thope@rideuta.com. 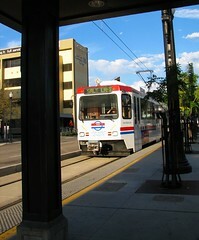 You can also visit UTA’s Web site at www.rideuta.com. 1) Inquiring minds have wanted to know for a long time why Amtrak never wants to report its metrics by standard measures used by all other types of common carriers, not to mention federal government reporting agencies such as the Bureau of Transportation Statistics. The reason is, Amtrak has a dirty little secret it doesn’t want anyone to know or figure out: Statistically, Amtrak is completely irrelevant as a part of our domestic transportation network. New figures have been released by BTS this month. The latest figures available from BTS are for 2006, but that doesn’t matter, because Amtrak’s figures are so very low, even if they were doubled Amtrak would still be statistically irrelevant. Just in case you think you read that Amtrak figure incorrectly, it’s one tenth of one percent market share. Yes, far less than a single percentage point. If you are doling out free federal monies in Washington, how high would that be on your priority list? Amtrak has certain members of Congress who will ALWAYS offer amendments to bills and other devices to defund Amtrak. When you look at Amtrak’s true numbers, you have to wonder why not more members of Congress don’t do the same thing? Just looking at raw numbers, Amtrak is not only a loser, but it’s a colossal loser, and screams government waste and boondoggle to rational people. If you are a political commentator of any stripe and are accustomed to either flying everywhere or driving to any destination (especially if you live outside of the Northeast), you can see why Amtrak receives little or no support for a future as part of our domestic transportation network. When someone cries "Close it! Sell it! Dismantle it!" they are doing so from a practical economic standpoint. Amtrak is, in the eyes of anyone doing cold, hard, analysis, unimportant. If Amtrak went away – even (gasp!) in the Northeast – there would be little, if any, impact on any roadway crowding. Even as heavy as traffic is on Northeast interstate highways, Amtrak’s daily passengers could still easily be absorbed onto busses, vans, and in automobiles. Now, you see why Amtrak only wants to talk about warm bodies/passenger counts. Amtrak says it carries about 26 million passengers a year, for an average of 70,000 passengers a day on its over 300 trains (most of which are Northeast Corridor trains) a day (including the two tri-weekly trains, the Sunset Limited and the Cardinal). What this tells us is a completely new approach is needed to "sell" passenger rail in North America. VIA Rail Canada isn’t much different from Amtrak in terms of percentage of population it serves; the only real difference is VIA has some social service routes which are critical to the inhabitants of remote parts of various provinces where no real roads exist. VIA and general aviation are still the only two forms of any type of transportation through or over some very desolate countryside. Here’s the good news. It doesn’t take much to sell travelers on the potential of passenger train travel, especially Generation Y (people in their 20s) travelers. To many, train travel is a new and novel experience to be embraced and enjoyed. If ever Amtrak gets away from insisting it must be the best kept secret in America, it will explode with riders. Some otherwise well-respected authors are continuing the tedious and false drumbeat about Amtrak having to perpetually be a step-child of government, and how it can never come close to making money or even breaking even. Since this canard is constantly put before the public, more and more people blithely believe this drivel without bothering to check for themselves what the realities are about passenger rail in North America. Yes, as long as passenger rail commands one tenth of one percent of the traveling public’s market share, it will always have to be an unwanted child of government. It if ever gets just to one percent of market share, it will be a success both financially and socially, as long as the correct business plan is followed. 2) As rational individuals, we know body counts are worthless; revenue passenger miles are the defining figure of measurement. Here are the same results for 2006, expressed in revenue passenger miles instead of percentages (in millions). Amtrak still comes out on the bottom, no matter how you express the data. If the presumption was made that every Amtrak passenger was unique every year (every passenger used Amtrak only one way for one trip a year), then Amtrak would be serving about 8.5% of the population of the United States. However, since the vast majority of Amtrak’s riders use the train as a round-trip service, and over half of Amtrak’s riders use NEC trains on a frequent basis, it’s safe to say Amtrak actually serves well under 3% of the population of the United States – again, making the service statistically irrelevant. 2) Let’s look at some other figures and trends, all courtesy of the Bureau of Transportation Statistics. Here’s a breakdown of U.S. passenger miles by mode over an extended period of time (figures in millions). Figures for prior to 1990 are only reported in five year increments. What’s interesting about the passenger rail figures is the huge drop – over 50% – from 1965 to 1970, a period still prior to Amtrak when most railroads were still running private passenger trains under government regulation. The drop from 1970 to 1975 includes the introduction of Amtrak with its skeletal national system and the removal of most remaining passenger trains in the country. Since the directed mission from the United States Department of Transportation in the creation of Amtrak was to determine what formerly private railroad routes could be considered sustainable after the creation of Amtrak, it’s obvious just the very creation of Amtrak instituted a false capacity constraint on passenger rail. The total figure of revenue passenger miles for 2008 – Amtrak’s best year ever – is still below that of 1970, the year before Amtrak started service and private railroads were still operating passenger trains under government mandate. What does this tell us? From the very beginning, by government directive, Amtrak has placed a false restraint on passenger demand in the United States. Even as bad as the last years of private passenger trains were by some railroads hoping to scare away passengers and only operate the barest of services, the public still wanted to ride trains. Not everyone wants to fly, and not everyone wants to travel by private automobile, no matter how wonderful the Eisenhower Interstate Highway System may be. What would have happened if Amtrak would not have falsely constrained demand? What would happen if Amtrak was not America’s best kept secret? What would happen if Amtrak’s senior management was actually interested in making the company a success rather than living off of the sour fruits of payments from state treasuries to run intrastate services at high prices while offering low value and bad service? 3) How did Amtrak falsely constrain demand? Let us count the ways, using higher math, of course, because simple arithmetic can’t handle the numbers. Amtrak has consistently replaced its original fleet inherited from the private railroads with fewer and fewer cars. Here are the numbers. Today, Amtrak has 1,551 fewer cars than it did in 2002, mostly due to older equipment being sold for scrap by previous Amtrak stewards, and Amtrak allowing too many cars to go onto the wreck line for minor maintenance issues which Amtrak chooses not to pay for to restore the cars to service. Again, Amtrak has intentionally created false passenger constraints by simply not providing enough equipment to haul passengers based on demand. While Amtrak’s Amen Corner choruses will incorrectly claim this is the fault of the federal government due to alleged under funding, the reality is Amtrak never requests funding for large equipment orders, nor does it explore viable options through bootstrapping equipment leasing schemes. Instead, Amtrak is content to annually ask for free federal monies to supplement its operations instead of searching for viable ways to support itself, perhaps, say, with the fabulous idea of hauling more passengers instead of seeking subsidies. 4) Most Amtrak supporters suffer from the unbecoming disease of modal envy, that scurrilous malady which forces people to think that just because some other mode of transportation has to have free federal monies to keep it solvent, so does passenger rail. Recent work in the private sector and current policy debates have refocused attention on Federal subsidies to passenger transportation modes. To provide the Department of Transportation with an independent analysis of this issue, BTS developed data on federal transportation revenues, expenditures, and net subsidies, by mode. Subsidy, for the purpose of this analysis, represents a simple accounting calculation of the net flow of funds to or from the federal government for individual transportation modes. The excess of expenditures over revenues is the net subsidy. To show the amount of subsidy relative to the level of use of transportation infrastructure, we normalized the data by dividing the absolute net subsidy values by passenger-miles. Users of the highway passenger transportation system paid significantly greater amounts of money to the federal government than their allocated costs in 1994-2000. This was a result of the increase in the deficit reduction motor fuel tax rates between October 1993 and September 1997, and the increase in Highway Trust Fund fuel tax rates starting in October 1997. School and transit buses received positive net federal subsidies over the 1990-2002 period, but autos, motorcycles, pickups and vans, and intercity buses paid more than their allocated cost to the federal government. On average, highway users paid $1.91 per thousand passenger-miles to the federal government over their highway allocated cost during 1990-2002. The net federal subsidy to passenger railroads was the third largest, except for the years 1998-2000, when it was second. The Taxpayer Relief Act of 1997 provided Amtrak with a tax credit in the amount of $2.18 billion in current dollars that caused the net federal subsidy to increase dramatically in 1998 and 1999. Passenger rail received the largest subsidy per thousand passenger-miles, averaging $186.35 per thousand passenger-miles during 1990-2002. Between 1990 and 2002, transit received the largest amount of net federal subsidy, increasing from $5.09 billion to $7.31 billion, an increase of 3% per year. Next to passenger rail, transit received the next highest net federal subsidy per thousand passenger-miles for the period, averaging $118.26 in year 2000 chained dollars. After transit, air transportation received the second largest net federal subsidy, except for the period from 1998 to 2000, when rail was second. Subsidies declined in 1998-2000 as a result of the increase in federal receipts from aviation users associated with the Taxpayer Relief Act of 1997, which increased existing aviation excise tax rates and introduced new taxes as of October 1, 1997. Net federal subsidy per thousand passenger-miles for air increased between 1990 and 1996 and then declined from 1997 to 2000, before rising again in 2001 and 2002. The decline during 1997-2000 was caused by the increase in federal receipts from aviation users as a result of the increase in the existing excise tax rates and the introduction of new taxes in 1997, which preceded increases in expenditures. So, for you in the back of the room sleeping, let’s have a quick review. Out of the 10 modes of transportation measured by the federal government, Amtrak is ranked ninth (9th) in market share, only above "Other Transit," which includes such modes as "demand response, ferryboat, and other transit not specified." 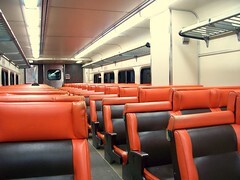 Being ninth in line – passenger automobiles, other passenger vehicles such as SUVs, and air being the top three modes – Amtrak in some recent years has received the second largest net federal subsidy, and often received the third largest net federal subsidy. To repeat part of the quote above: "Passenger rail received the largest subsidy per thousand passenger-miles, averaging $186.35 per thousand passenger-miles during 1990-2002." Please, stop the modal envy. Amtrak is cleaning up when it comes to free federal monies. Every other mode should be jealous of Amtrak, not the other way around. 5) Where are we in the Winter of 2009? Amtrak is statistically irrelevant. But, even if it gains just one percent of the national transportation market share, it can be self-sustaining without annual federal funds. This doesn’t mean it has to go private (as appealing as that is to many people), but it does mean it doesn’t have to live and die by the will of reluctant lawmakers who constantly use Amtrak as a political pawn. Prior to the introduction of the Boeing 707 jet aircraft and the building of the Eisenhower Interstate Highway System, passenger rail had the vast majority of market share in North America for moving passengers. Those days will never be repeated, mostly because there are too many good alternatives to passenger rail. But, passenger rail has tremendous growth potential to regain enough business to make it relevant. Put all of the annoying tree-hugging arguments aside. Make a modern case for the business of passenger rail. Take visionary schemes like Gil Carmichael’s Interstate II and make them a reality, tugging passenger rail along for the ride. Most people don’t ride a train for four main reasons: either they don’t know train service is available, today’s embarrassingly skeletal offerings are too inconvenient, no Amtrak service is available to them, or they have joined the thousands of legions of "never again" passengers Amtrak has mistreated in one way or another over the past nearly four decades. The next time you hear a politician or political commentator griping about Amtrak, just be grateful they even know enough about passenger rail to complain about it. Statistically, Amtrak should never even be a topic of conversation, it’s so insignificant. As soon as Amtrak management embraces a true growth strategy which includes good passenger service, then Amtrak will become more and more relevant. As long as Amtrak chooses to remain a ghost of America’s past transportation glory, it will be unimportant to almost everyone except Amtrak’s Amen Corner choruses, who are often Amtrak’s worst enemies in disguise because of the enabling they provide for poor management and bad business decisions. 6) We promised last week more in this issue about Amtrak’s winter naughtiness and the appalling lack of functioning locomotives outside of the Northeast Corridor. We promise – really – to address this topic in the next issue of TWA. We’re still gathering information, and had hoped to have more by this point in time. This article has more details on what UTA is proposing for Davis County. I haven't posted one of these in a couple of months so here is one covering events happening in Maryland including pedestrian facilities on new bridges. There is also a section talking about the proposed Purple line in the Washington DC Area. Utah, with the following agenda. 2. Swearing in of Board Members. 3. Public Comment (10 Minutes). Completing the Transaction on the Best Possible Terms. Physical or Mental Health of an Individual. c. Strategy Session to Discuss On-going and/or Potential Litigation. 9. Action Taken Regarding Matters Discussed in Closed Session. a. Approval of Financial Statements of November 30, 2008.
b. Approval of Minutes of Board Meeting of December 17, 2008.
a. Status of the Potential Federal Stimulus Program. wise investment of physical, economic, and human resources. Below is the FrontRunner South quick construction update for January 17 - 26. There will be no construction occurring in the area this week. There are currently no traffic impacts in this area. Fiber optic relocations continue in the area with boring taking place at 5300 South, I-215 and 7200 South this week. Progress continues in Area 14 behind Salt Lake Community College’s campus at 9800 South as crews construct a bridge that flies over the Union Pacific Railroad tracks. This is the area where FrontRunner will move from the east side to the west side of the tracks. Crews have driven steel pile into the ground to build the base of this structure and are continuing to construct rebar cages for drilled shafts. They will drill and pour one pier this week. Crews are also constructing a bridge adjacent to the current Union Pacific Railroad bridge at 144th South. Crews will form and pour concrete for the back walls of the structure this week. We thank motorists in this area for their patience and support during construction. Fiber optic work continues with boring taking place at 100th South and 123rd South. A temporary traffic light has been placed at 144th South and the Union Pacific Bridge to help with traffic flow in this area. Area 14 – Concrete is poured for the north abutment of a bridge adjacent to the current Union Pacific Railroad bridge at 144th South. Crews continue to establish access in this area and prepare the site along the railroad corridor in Bluffdale and Lehi. Excavation and embankment work throughout the area will continue this week as will fiber optic microduct installation. Crews will form and pour concrete for the floor slab and aprons of a bridge spanning the East Jordan Canal. They will also begin to form the walls. Impacts to motorists should be minimal as work proceeds along the railroad right-of-way. Crews will continue to work on temporary shoring for construction of the pedestrian tunnel that will run underneath the Union Pacific trackway at the Lehi Station. Fiber optic work continues throughout the area with boring at roads and microduct installation taking place this week. Currently construction is not taking place at this station. Drainage and irrigation improvements and embankment work continues along the Union Pacific Railroad tracks from Orem to American Fork. Construction is underway for a bridge spanning the American Fork River. Crews will continue to form and tie rebar for the north and south abutments this week. Significant progress has been made in Area 10 along the Union Pacific Railroad corridor between University Parkway in Orem and West Center Street in Provo. Crews have prepared a path for FrontRunner by grading and clearing the right-of-way and relocating water lines. Crews will begin fiber optic microduct installation throughout the area this week. Thanks again for your interest in the FrontRunner South project. If you have construction related questions, please call our 24-hour construction hotline number at 1-888-800-8854. If you have specific questions about the FrontRunner South project, my contact information is listed below. To unsubscribe from this list, please click here, or simply send a reply message indicating you wish to unsubscribe.